Until the 1820s the southern part of Hampstead was almost entirely rural. Apart from the Belsize Estate, the most notable feature of the area was the Chalcots Estate, 243 acres of land owned by Eton College with the manor house of Chalcots to the north, at the west end of the present England’s Lane. Adelaide Road was one of the earliest roads to be constructed in the area, being started in 1830 before the arrival of the railway. It was named after William IV’s newly crowned queen. Having a short section of Adelaide Road actually on the ground gave credibility to Eton’s case that the railway proposed to cut through valuable building land. But it was not until 1839-40 that development really got under way. The Company was involved in negotiations about running its line across the Eton College Estate from 1831. The College initially resisted the idea strenuously, primarily on the grounds of its adverse impact on landholders and the consequent reduction in the value of leases. However, the fact that the College’s solicitors were also the agents for the L&BR helped the negotiations between the two parties. The Company maintained that the railway lines would be carefully fenced and that opposite “gentlemen’s residences” the fencing would be ornamental. It claimed that carriages made little noise, while the engines were so clean and silent that nobody would notice they were there. The L&BR bought off any possible College obstruction by agreeing to put the line in a tunnel through the Chalcots Estate. From an engineering viewpoint this was unnecessary as the rails were never more than 50 ft below the ground surface, and side slopes of 1 on 2 were specified initially. 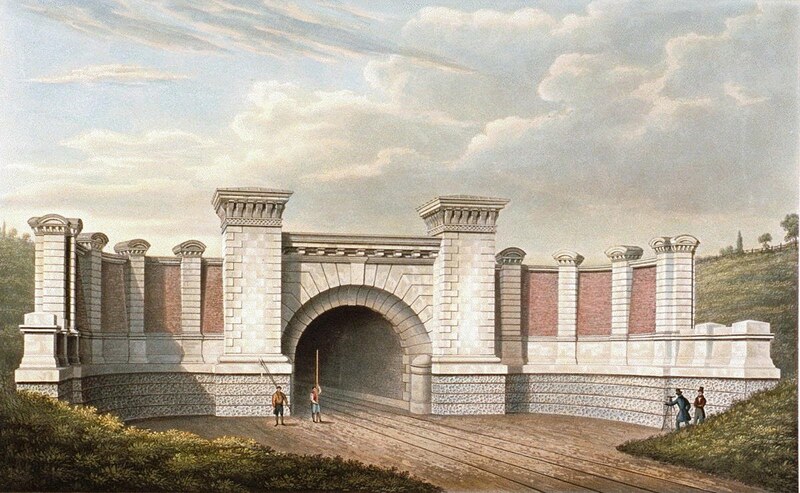 A tunnel had the merit of using no land, the surface being preserved for building by a special provision in the Act that “the Tunnel shall be constructed of sufficient strength to admit of buildings being erected thereon, except where the crown of the Tunnel is within 15 ft of the surface”. To make doubly sure, it was also provided that the tunnel had to be made by tunnelling and not by ‘cut and cover’ methods. Finally, in order to ensure the minimum interference with building values, Eton insisted that “the mouth of the Tunnel at the eastern end shall be made good and finished with a substantial and ornamental facing of brickwork or masonry to the satisfaction of the Provost and College…” The proud classical elevation reflects the upmarket development intended for the neighbouring Chalcots Estate. 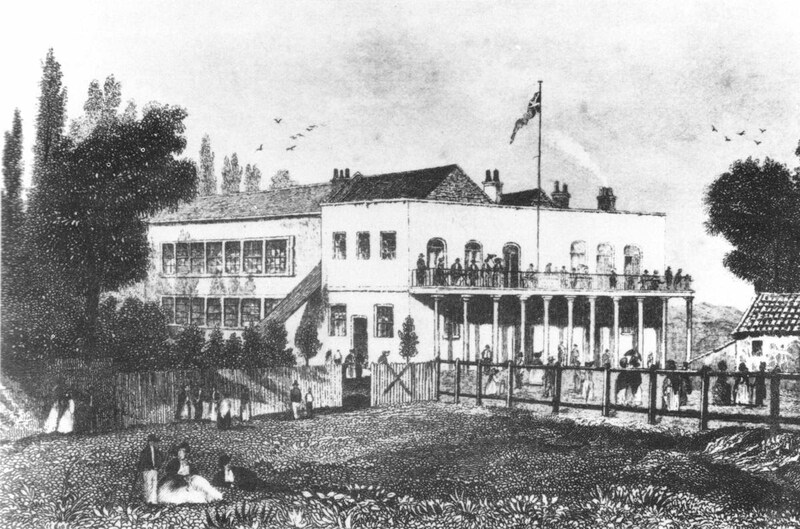 Primrose Hill had for long been a favourite resort of London’s citizens who came for a day out to view the London skyline. The old Chalk Farm Tavern included pleasure gardens on the site now bounded by Berkley Road, Chalcot Square and Sharpleshall Street. These were a focal point from the 18th century until 1865. At the height of its fame the Tavern boasted a dance floor capable of taking one thousand people as well as a bandstand known as the Chinese Orchestra, which was 36 ft high. The original Primrose Hill Tunnel was London’s first railway tunnel and considered a great feat of engineering in its time. Crowds gathered both to watch the construction of the railway and to stroll along the railway cutting to admire the trains in operation as shown in the picture to the right. Apart from about 21 yards (19 metres) at each end built in ‘cut and cover’ the 1100 yard (1000 metre) tunnel was excavated from four 8 ft (2.4 m) diameter shafts, the working face not being allowed to advance more than 6½ ft (2 m) ahead of the brickwork lining. One of the shafts remains open for ventilation, behind louvres in the car park of the Marriott Hotel, west of Hawtrey Road and near the mid point of the tunnel. The tunnel was difficult and dangerous to construct because of the pressure of the clay, which swelled when exposed to the atmosphere at depth. The pressure that the moist clay exerted on brickwork caused mortar to be squeezed from joints and crushed bricks brought into contact. To resist this pressure the tunnel arch thickness was increased to 27 inches (686 mm), and stronger ‘paving’ bricks were used in place of London ‘stocks’, substituting quick-set Roman cement for lime mortar. It was completed in January 1837. When the tunnel was being built, the Chalk Farm Tavern was usually the first resting place of the navvies killed in the works. The Tavern was rebuilt in 1853-4 to a size much smaller than its predecessor. The popular Greek restaurant, Limonia, now occupies the 1854 building. 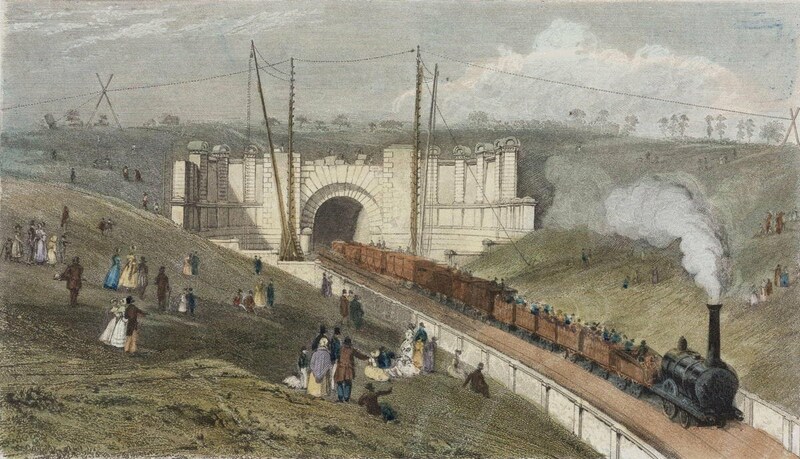 The L&BR, as a long distance line, did not of course have the effect of creating a demand for housing in its vicinity but the public’s attraction to the entrance to the Primrose Hill Tunnel may have served to alert speculators to the existence of Chalcots Estate and advertised its healthy situation. Boundary walls were provided at the foot of the cutting, and the Eton Estate appears to have retained ownership of the land to these walls, at least until the railway was widened. This unusual feature encouraged the public to use the land without trespassing on the railway, and helped to publicise the Chalcots Estate. Primrose Hill Tunnel East Portals (Grade II*) include both the original northern portal completed in 1838 and the southern portal dating from 1879. Built by William Baker, engineer-in-chief of the LNWR, it faithfully replicates the design of the original portal down to decorative detail such as the lion masks but is taller than the northern portal to retain the land rising up to Primrose Hill.